I use a single Gibson style truss rod. This is a rod anchored at one end (the body end of the neck, in my case, and set in a curved groove in the neck. the groove is deeper in the middle than the ends and there is a filler strip on top of the rod which is curved in the same curve as the slot. The adjustable end is at the peghead where there is a metal washer (for a bearing surface) and an adjustable nut. 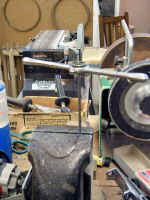 Tightening the rod in effect shortens it and forces the rod into a slightly straighter form, and this straightens the neck - if all goes well. 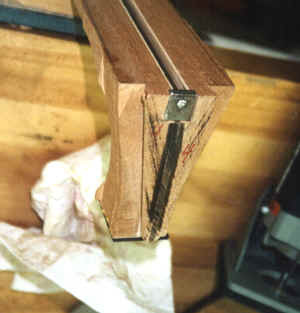 Based on some 30 years of running a repair shop and building guitars it seems to me that this mechanism works as well as any and better than most - if the neck is well built as well. 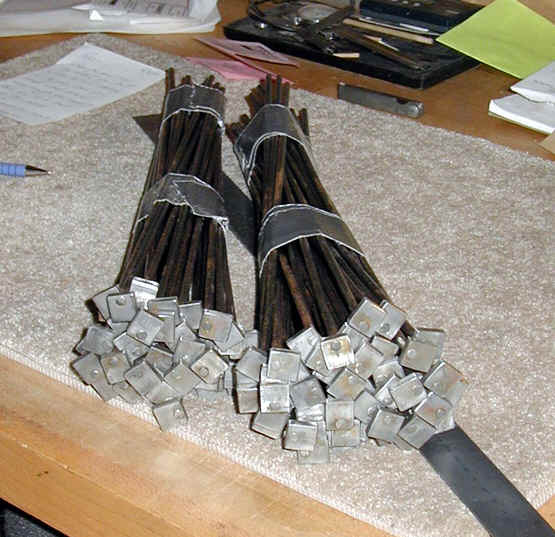 I recently had a machinist friend make up a batch of 100 truss rods. 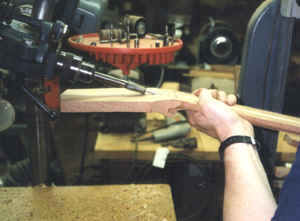 Here I am beginning to install the truss rod. 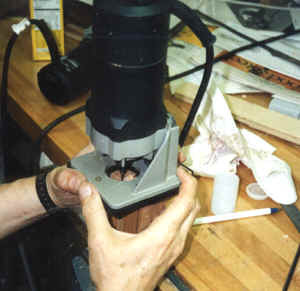 I am using a small router to cut the pocket which holds the truss rod anchor. The anchor pocket is cut. 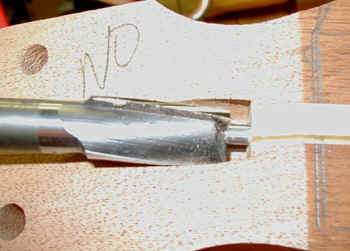 The anchor end of the truss rod. 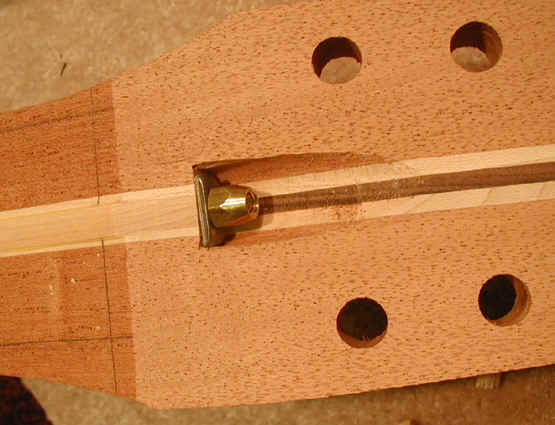 The truss rod in place. 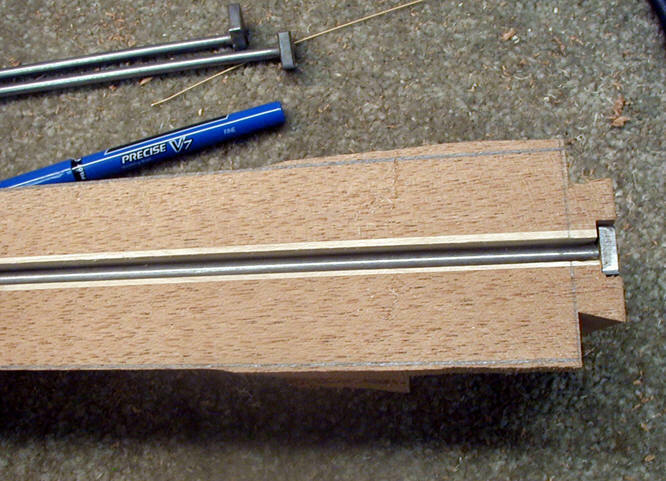 The curved filler strip which will hold the truss rod in the curve which is important to its proper function. I make my own truss rods. They are of the Gibson style. A 3/16 steel rod (I buy drill rod from a machine supply store) that is threaded on both ends with a 10/32 thread. One end goes in the anchor (made of 1/8" steel) and the other will receive the adjustment nut. As noted above, sometimes a I have a batch made up by a machinist friend - saves a bit of time and I am not fond of metal working. 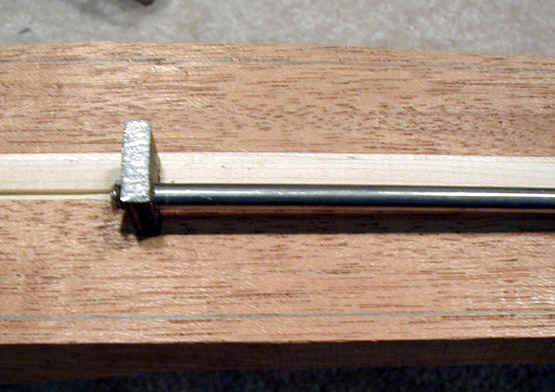 Here is a completed truss rod. 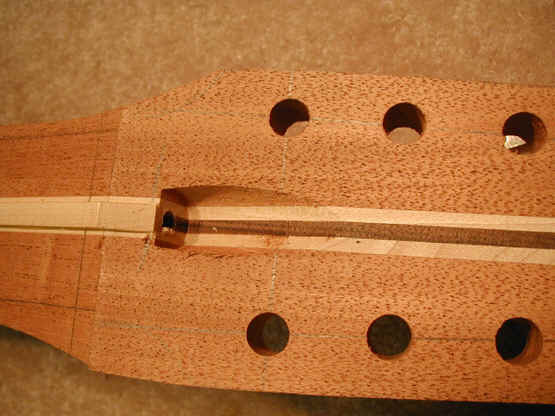 The pocket in the peghead for the truss rod. 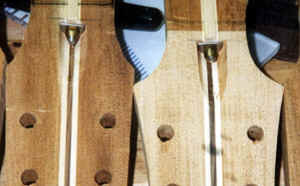 The truss rod is placed in a curved slot and covered with a curved piece of maple which matches that curve. 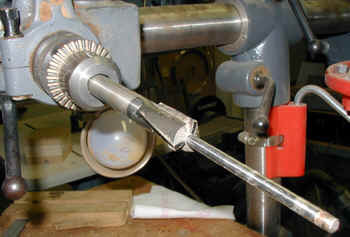 An earlier photo showed the jig used to cut the slot on the spindle shaper. Here the covering pieces are being glued in place. 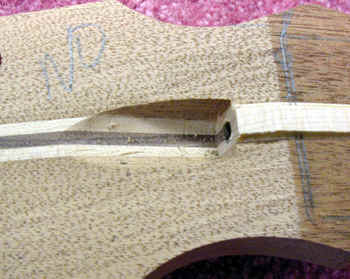 Next, I cut the pocket in the peghead which will accept the truss rod nut. I use a tool called a counterbore. This is really just a drill (1/2" in my case) with a 3/16 rod sticking out of the end. Machine shop suppliers carry them in all sizes. I pull the truss rod out of the slot (after the filler is glued in, and the rod on the counterbore guides the drill perfectly. Here is the counter bore in action. Here is the truss rod pocket cut by the counterbore. 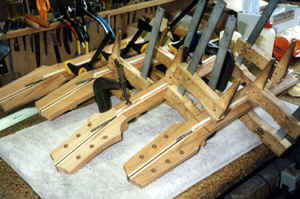 Several pegheads with truss rods installed. As I mentioned above, I use the Gibson style truss rod. After almost 30 years of repairing guitars, my experience is that this style works very well. Some complain that this is not a double acting rod - i.e. that it does not both remove and add relief to the neck. This is very easy to fix. 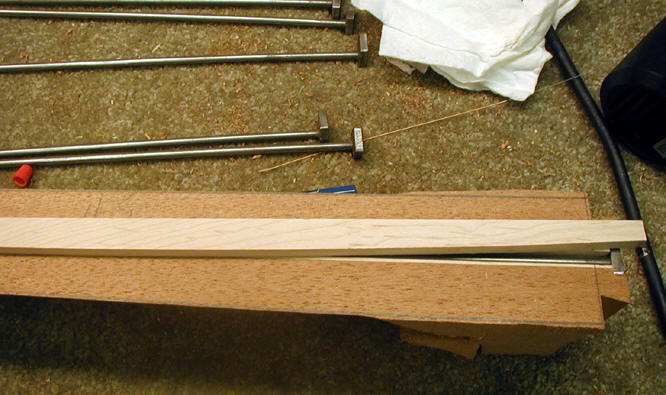 After the truss rod is installed, I pre-tension it (about 1/2 turn ) which adds a small amount of backbow to the neck. Then I sand the fingerboard surface flat again and voila, I have a double acting truss rod. This is one of the reasons I remove a lot of waste wood on the spindle shaper - having the neck blank close to final size makes this step work more effectively and predictably.